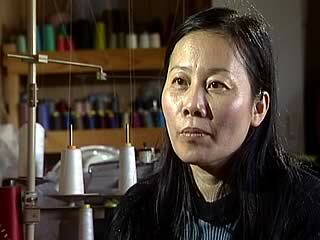 Video clip synopsis – Migrant women work long hours sewing garments at home for a few dollars an hour. Many are refugees and have little understanding of their rights or the chance of alternative employment. Broadband MP4 heart_bb.mp4 (6.1MB), suitable for iPods and computer downloads. Outwork- A Vietnamese Refugee’s Story is an excerpt from the film Heart On The Sleeve (26 mins), an episode of the series Fearless – Stories From Asian Women (4× 26 mins), produced in 2001. Heart On The Sleeve: Although Australia has a first-world economy, hidden within it a third-world industry thrives. Outworkers sewing at home are paid per piece by clothing companies. They work to unforgiving deadlines, often seven days a week, for a pitiful few dollars per hour. Hundreds of thousands of workers from non-English speaking backgrounds suffer in these archaic conditions. They have no sick pay, leave, superannuation or insurance. Now, Hien Tran, former Vietnamese refugee turned union representative, is speaking up for her fellow outworkers, trapped by their circumstances and financial need. Fearless – Stories From Asian Women examines the experience of four women fighting for social justice. Each is from a different culture and has her own fascinating story to tell. All are united by their refusal to remain silent and accepting. These courageous and committed women are prepared to risk everything in pursuit of human rights. This compelling series examines the issues that incite them to action, their personal motivations and their hopes for the future. Fearless – Stories From Asian Women is a Film Australia National Interest Program in association with Mask Productions. Produced and developed with the assistance of ScreenWest and the Lotteries Commission of Western Australia. Produced in association with SBS Independent. At Level 5, students present points of view on contemporary issues and events using appropriate supporting evidence. They explain different perspectives on some contemporary issues and propose possible solutions to problems. At Level 6 students analyse events which contributed to Australia’s social. Political and cultural development. These events could include: immigration. They explain aspects of increasing global interconnections in the twentieth and twenty first centuries. At Level 6 students locate relevant resources, including inline resources. They identify, comprehend and evaluate a range of primary and secondary sources. They critically evaluate sources of evidence for context, information, reliability, completeness, objectivity and bias. Outwork is a system of production involving people working at home for a manufacturer. Although Australia has laws regarding minimum wages and occupational health and safety, the system is open to abuse. How does the law protect this woman? Why should ‘outwork’ be illegal if it eans that more work can be completed? Imagine a dialogue between an outworker, an employer and a union representative. What position would each take? How would each justify their position? Why does outwork seem to be so heavily associated with female migrant workers? Suggest reasons and for this, and ways you might test these hypotheses. What does this clip tell us about ways in which the immigration policy of Australia may have ‘gone wrong’?